Hi, I am interested in your 1959 Jeep Other Jeep Models (stock #MHM3096) listed on Autotrader for $23,900. I'd like to get more information about this vehicle and confirm its availability. 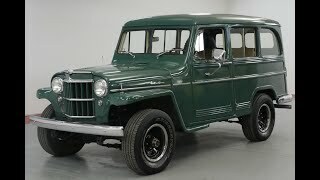 Worldwide Vintage Autos is pleased to present this Beautiful 1959 Willys wagon 4x4. The Jeep legend began in November 1940, in the early days of World War II, just a year before the United States entered the war. A small, four-wheel drive prototype, the Willys Quad, was delivered to the US Army. It featured the Willys Go-Devil engine, developed by Delmar Barney Roos. With 60 horsepower and 105 foot-pounds of torque it not only exceeded the Armys requirement, but dwarfed the Bantams 83 and Fords 85 pound-feet of torque, its only competitors for the military contract. The Quad was the father of the MB, CJ series, and Wrangler. Willys refined the Quad and built 1,500 units of the Willys MA model, many of which were used in WWII.